Scroll down and click on the video clip to find out about the glasshouse's rainforest climate and how it was built. Lizzie and Hugh visit this glasshouse in the story. Planning a visit to Kew Gardens? Visit the Kids Kew webpages for kid-friendly places to explore and useful information. Florence Nightingale was know as the Lady with the Lamp. Click on the painting to see a larger picture. Kitchen staff usually drank a less expensive tea than the family of the house. Scroll down to 1850s and click on the pictures to see larger images. Part of a series of stories about fictional characters living through real-life historical events, and set in a real house: No. 6 Chelsea Walk, London. Each novel explores an historical era from a child's perspective. Beautifully captures the heroine's ambitions, struggles and desires. Includes Internet links to recommended websites where readers can find out more about life in Victorian times. 1857: On an extended visit to her cousins in London, Lizzie visits the newly opened Kew Gardens. Like her elder cousin, who wants to defy her middle-class upbringing and become a nurse, Lizzie has ambition and the will to go against the conventions of her Victorian peers. She wants to be a gardener, and the first step towards her dream is to plant a walnut in the garden of No. 6 Chelsea Walk. For eight to 12-year-olds, the Historical House series comprises three novels set in the same London house during different periods. 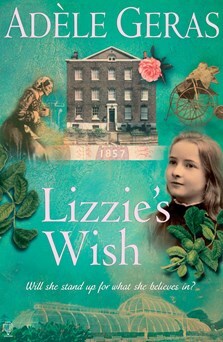 The first is Adele Geras' Lizzie’s Wish, set in 1857. Linda Newbery and Ann Turnbull follow with stories set in 1914 and 1941. Lizzie is sent to live with wealthy relatives leaving behind her pregnant mother in the company of her stern stepfather. London opens Lizzie's eyes to a different kind of future from the life endured by her mother. All three novels shed an impressively wide light on the social and economic picture of their time, with a particular focus on women’s issues. Geras's novel is concerned with the vulnerability inherent in growing up and the hardiness required to survive it…An engaging read with quite a fast paced and active plot, Lizzie's Wish is also particularly suitable for considering not only Victorian history but specific questions of gender…It is certainly more suitable for younger readers but is so well furnished with references and ideas that would make its study fruitful. This is the second bok I've read, it was also very exciting. I recommended it to my cousin, and she has bought the rest of the series. It was as good as the first one.